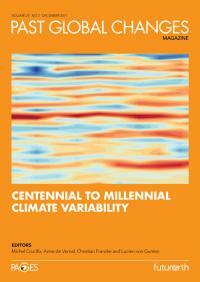 This issue of Past Global Changes Magazine “Centennial to Millennial Climate Variability" shows how recent progress in our knowledge of past climates led us to revisit our ideas about the spectrum of natural climate variability. Contributions highlight the concept of scaling laws, but also warn about pitfalls of paleoclimate timeseries analysis. It is a product of PAGES' Climate Variability Across Scales (CVAS) working group.